As a blogger, you know the importance of goals. It’s a basic requirement for any business and a necessity for anyone who wants to move forward in life. Without goals, we are just wandering around with dreams and good intentions. While having goals is good, making them great is what leads you to extraordinary results. How do you take goals from good to great? Analyze your goals for relevance. Prioritize them based on importance. Create daily/weekly systems to give them staying power. In the world of money, they say personal finance is 20% head knowledge and 80% behavior. I think the same applies to business goals. You can spend 20% of your time creating goals, but to make them work, you need to spend 80% of the time making them happen. So let’s get down to it. Here are 4 ways to take your goals from good to great. What is the ONE thing I can do such that by doing it, everything else will be easier or unnecessary? Take one of your current goals and plug them into this focus question. Measuring your goals through this vernacular will help bring clarity and get you focused on the goals that are right for you. Once you find the right goals to focus on, the next step would be to find which ones to focus on first. But before we go there, I want to highlight an important aspect of getting your goals accomplished. Stop trying to take on too much. 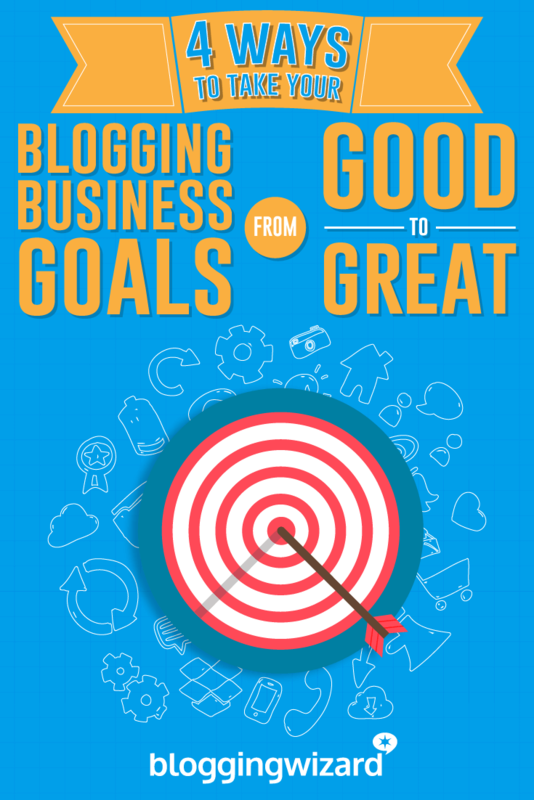 As bloggers, we have a laundry list of goals, big and small. Things we want to accomplish and things we need to accomplish to get our blog and our business where we want it to be. We get sucked into the idea that multitasking is the ultimate productivity hack. If you chase two rabbits, you will not catch either one. – Russian Proverb. Multitasking makes us ineffective, kills our intelligence quotient, and puts unneeded stress on our brains. Of course, we can do simple tasks like wash dishes and talk on the phone, or listen to music and clean the house. But when we try to multitask things that require focused attention, like answering emails or researching a topic, our brain has to switch between the two. The act of switching between tasks is where we lose our effectiveness. Try as I might, I cannot do email, and enjoy The Big Bang Theory at the same time and be efficient at both. When I first started blogging, I was trying to write, edit and proofread at the same time. I thought that’s how it was done to publish consistently. Later, I found I could get more done, and create better work if I focused on each task separately. Write without worrying about errors, proofread without worrying about structure, and edit without worrying about the topic. When you separate tasks into specific processes and only work on one important thing at a time, you get more done in less time. And your work doesn’t suffer. Inspirational entrepreneur and weightlifter James Clear explains how multitasking reduces your ability to get your best work done. You may look busy if you try to do more than one task at a time, but you’re not getting any quality work done. Shut off your phone, close out all browser tabs that have nothing to do with your task and get down to serious, productive work. Have you been trying to finish that online course you bought two months ago? Set a block of time once a week for 1 hour to focus on learning from that course. Do it once a week for however many weeks it may take to finish. Make it a part of your learning plan. Have you been trying to finish setting up your Teachable course? Clear your blogging schedule (or outsource your work to a freelance writer) and spend focused amounts of time working on creating the course curriculum. The point here is to work on one thing at a time. One goal at a time. When we try to chase more than one goal, we lose out on the opportunity to do our best work, and we won’t succeed very well at any of them. Now back to making those goals awesome. So you’ve got the right goals on paper, and you’re in the mindset to work on one thing at a time, your next step would be to prioritize. When figuring out which goals to work on first, ask yourself these three questions. Are you realistic about the goals you have now? Are there are some goals you can let go of? Are there any goals that have more priority over others? This next method can help you answer these questions and help you prioritize which goals go first. Stephen Covey, the author of The 7 Habits of Highly Effective People, popularized an effective time management technique based on the Eisenhower Urgent/Important principle. Although the idea behind using this box was originally made for time management, it’s an excellent tool to help you prioritize goals and related tasks into what is important now, what’s important later, and what’s not important at all. Another version of this popular time-management principal was created by Amy Lynn Andrews, author of Tell Your Time. Amy takes Stephen’s matrix and simplifies it into a micro view of daily and weekly tasks based on your personal and business priorities. Use these matrixes to help put your goals in perspective. For example, say you want to do better with managing your blog. Some of the things you need to do to maintain your blog are writing and editing, generating lead magnets, responding to comments, and social media networking to name a few. 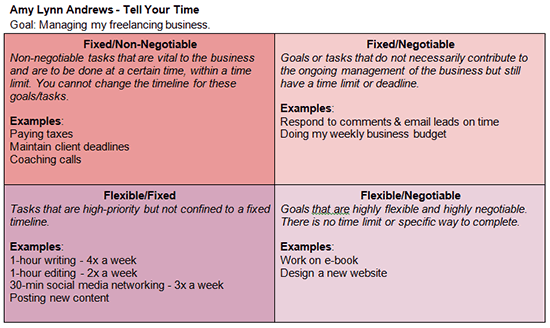 Use the Covey matrix to prioritize which one of these tasks are Important/Urgent (or Fixed/Non-Negotiable). Writing and editing and social media would be non-negotiable and urgent – your blog won’t exist if you don’t write new content and share it on social media so people could find you. Generating lead magnets and responding to comments would be more fixed/negotiable but still important because although you don’t have to do these things every day, you at least need to do them once a week or as needed. Use these methods to prioritize your long and short-term goals, just as you would for activities relating to time management. Move your goals and related activities around as you analyze them for importance and urgency, flexibility, or negotiability. As you complete goals – or if new ones happen along – go back to your matrix and re-prioritize. Now you’re ready to supercharge your goals and manage them properly. Here is where extraordinary results come to life. …The secret to getting started is breaking your complex overwhelming tasks into small manageable tasks and then starting on the first one. Let’s take a page from James Clear’s playbook and manage goals by creating systems for them. After all, what is the best way to climb a mountain? Don’t mistake systems for goals, they are related but very different. Goals represent the mountain and systems represent each planned step you’ll take to climb the mountain. You can also think of systems as the daily habit that will help you accomplish a specific goal. If your goal is to write a short story of 8000 words, your system would be to write every day for at least 30 minutes until you reach the goal. My schedule doesn’t always work this perfect, but if I keep working like this, I can accomplish my goal of one new piece of content each week. Once you figure out which goals to focus on first, create a system that allows you to manage it every day until you accomplish that goal. Here are a few examples from James Clear to get you thinking. …if you’re a runner, your goal is to run a marathon. Your system is your training schedule for the month. If you’re a [sports] coach, your goal is to win a championship. Your system is what your team does at practice. When you break goals down into manageable systems, those systems eventually become a habit. And when a system becomes a habit, that goal no longer takes much effort to achieve. Stop multitasking. Focusing on one thing at a time so you can get your best work done and accomplish your goals in record time. Prioritize your goals and strive for efficiency. Find out which goals come first by using the urgent/important principle or the fixed/non-negotiable matrix. These are visual planning tools to help you focus on goals so you can manage your time better. Create systems by breaking down your goals into manageable daily/weekly actions that keep you working toward your goal. Whether you’re a blogging veteran or a budding freelance entrepreneur, the goals you set will be the vehicle that drives your passions. Setting off on great goals get you amazing results.